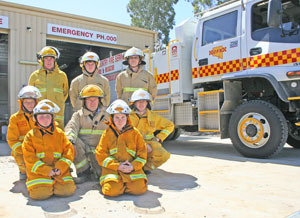 The Port Wakefield CFS brigade may have few members but cadets make up more than half of the group (12 of the 20 total). Captain Andrew Dunne said cadets are extremely important because they are the next generation of the CFS. “We encourage them to push that little bit further to build up their abilities,” Mr Dunne said.“It is important to have a mixture of young and old people; the older people have experience, which helps bring the younger ones up to the same level.“Our longest serving member started out as a cadet and he has been in the group for more than 40 years.”Tiffany Dunne, 17, joined as a cadet at age 11 for something to do and to “stop fires destroying things”. The Port Wakefield CFS brigade has about 20 members, 12 of whom are cadets; the brigade is always looking for more members. Back: Lex Robertson, Andrew Newton, Nick Marcks; middle: Barry Vandoorn, Andrew Dunne, Jason Jesnoewski; front: Daniel Dunne (cadet) and Tiffany Dunne.